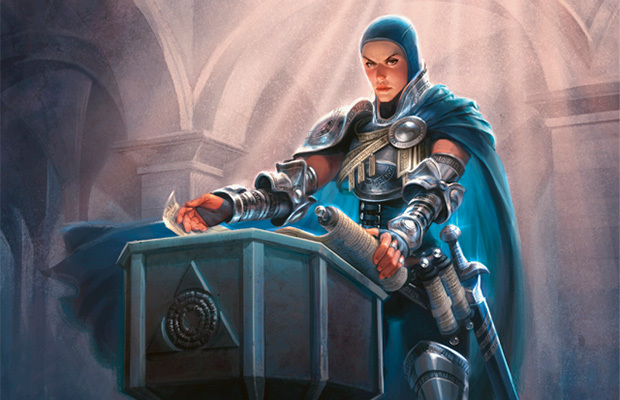 Jace appeared on Ravnica already late, judging by the speed with which a courier had found him upon arrival and by the number of times the message used the word "urgently," which was three. Lavinia, formerly the Azorius maze runner and currently Jace's aide and deputy at the Chamber of the Guildpact, tended to deploy adverbs when Jace was falling behind in his duties. The newly built halls of the Chamber of the Guildpact echoed with the distinct sound of clopping hooves. That was not a sound Jace traditionally associated with the official sanctum of the Living Guildpact. 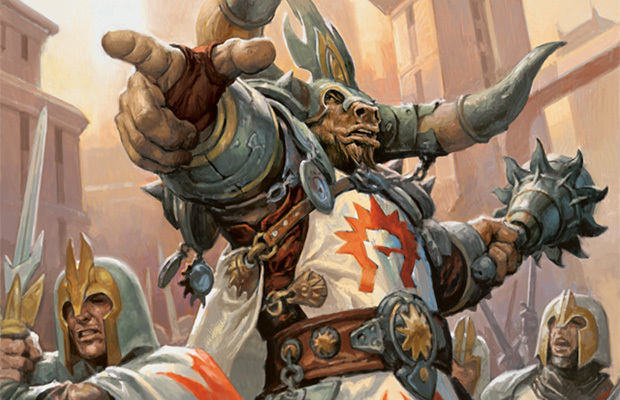 He hurried to the main receiving hall, where the corridor expanded to reveal a crowd of bellowing, steel-clad minotaurs with Boros tabards. Lavinia stood among the complainants, the only one not bellowing or stamping hooves. Her Azorius armor shone with a regulation gleam. "The Orzhov violated our boundary contract!" roared the lead minotaur. "They're collecting levies on Legion land!" Other minotaurs stamped and rumbled in agreement. "Your guild has not filed a proper complaint with this office," said Lavinia evenly, drowned out by the racket. She shook a piece of paper in the air as if it were a weapon. "Once it is filed, your case will be considered in due course by this Chamber." "How can I help?" asked Jace, emerging into the room. The minotaurs immediately shifted their bellowing to him. "Guildpact!" roared the minotaurs. "The Syndicate lied about the terms of our agreement!" "Unfair! They're trying to disrupt our summit!" Jace conjured words in Lavinia's thoughts. "Sorry I'm late. Was this why you summoned me?" "No," came Lavinia's thought in reply. "Petty dispute. I can handle them. I have something else that requires your attention." Jace tried to smile in what he hoped was a welcoming fashion at the minotaurs. "Is it murder? " "Because you're making that face. Your 'there's been a murder' face." "More than one, in fact. I have a 'there's been a murder' face?" "What's this summit they're talking about?" 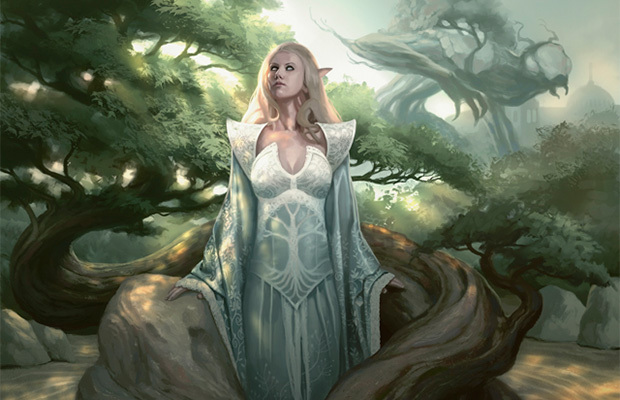 "Aurelia, guildmaster of the Boros, is hosting three other guild leaders at Sunhome tonight. The Legion is concerned about security, and the Orzhov apparently aren't helping matters." "Guildpact, what is your ruling?" the minotaurs insisted. Jace stood before the lead minotaur, a head shorter and with two fewer enormous horns. "You will file a proper complaint with Deputy Lavinia," he said, to a chorus of scoffing. "Return to Sunhome, and the deputy will handle it in due course according to Chamber procedure." Jace held his breath. He was the embodiment of the concord between Ravnica's guilds, a manifestation of stability, but he was also a very alive and mortal sack of organs. Every time he exercised his power as Guildpact, he felt both a sense of grand, mystical authority and a not-so-mystical sense that everyone on Ravnica was about to stomp a lot of times on his gastrointestinal or facial areas. He exhaled only when the lead minotaur sheathed his axe. Sunlight angled into the Chamber windows from just above the skyline. Jace studied a page of notes from the crime scene. The cause of death in every case: petrification. He looked up at Lavinia. "Are we sure they're victims? Somebody didn't just... carve very lifelike statues? Really fast?" Lavinia shook her head. "Not likely. These citizens have been confirmed missing. And the petrified bodies were all found in Rozlad Square." "Golgari turf. Near the tunnels of the Stonefare." "But not inside it. The statues were out in the open. Displayed. And there's more." "Don't tell me. The killer arranged their bodies to form the Golgari symbol." Jace snapped his fingers. "No! They're arranged to spell out the killer's name. In the shapes of his terrified victims." "They spell out your name." "Oh." Jace heaved a breath. He really needed to get a desk at some point, with a big leather-bound chair that he could slump into at times like this. "Well. All right." "We don't think the connection to you is public, yet. Some of my officers covered the victims and moved their bodies offsite. And we're not telling the families about the message they spell out." "On the other hand, the letters they make are pretty clear. We can't exactly reposition their limbs without damaging them." "Was there anything else at the scene? Any other message?" "We found nothing like that." "Was there any link between the victims? Anything in common?" "They're from all over. The killer must have transported them from multiple districts." Jace hunted through the list of details, not even sure what he was hoping to find. Nothing seemed to connect. But as his eyes flicked across the page, a chill sensation sank into his stomach. "Are these names right?" "The victims'? As far as we know." "Linna Stradek. Shann Dilara. Haszin Dycar." "What is it? Do you know them?" "Not exactly. Lavinia, I need to visit the scene immediately." She nodded and marched toward the door. "I'll get some lawmages to accompany you." Jace stopped her. "No. Not this time. Clear out all your officers and mages from Rozlad Square. I'm going alone." Lavinia's brows dropped low over her eyes. "Into the killer's trap? I won't allow it. Nor will a shred of logic." "Don't argue. Just keep everyone away from that location until I say. Go to Sunhome. Reassure the Boros." She pointed at her face. "Do you know the face I'm making now? It's a new one. It's my 'I'm considering committing your murder' face." "I know that face, actually. But just trust me. Keep everyone away from there, and head to the summit. Please." The victims' names meant something to Jace that it would never mean to Lavinia, or to any other planebound citizen of Ravnica. Linna Stradek. Shann Dilara. Haszin Dycar. Rozlad Square was dark and quiet, its walls covered in fungi and lichens. It was empty of Lavinia's officers, but it was not abandoned. In the center of the plaza stood a figure in a jade green cloak, her face obscured by a hood. Possibly human, judging by the silhouette. And she was certainly there to see Jace. Only a Planeswalker would know the names of all those worlds. And only a Planeswalker who knew that Jace was a Planeswalker would target him in particular, by selecting victims by those names. Whoever petrified those bodies knew a lot about Jace Beleren that he had tried to keep tightly under wraps. "I'm glad you got my message," said the woman. "You have my attention," said Jace. "I'm alone. So let's not bring other Ravnicans into this." "Oh, I've sent my compatriots away." The woman pulled back her hood with one hand, and produced a long dagger with the other. She was human, gaunt and dark-eyed, with a collar of spikes under her cloak. "So it's just the two of us. Why don't you come closer." Jace frowned, but stepped closer. "I'm not armed. I don't want anyone else harmed. I just want to talk. But I don't think that's what you want. Do you mind if I read you?" Jace focused his mind, preparing the spell to reach into the thoughts of the woman before him. But before he could peer into her mind, the woman stiffened. A cry made it halfway out of her throat before stone spread over her and enveloped her form. She became a stone statue before his eyes, a lifeless object. "Have you already read me, Jace Beleren?" came a different woman's voice from behind him. Jace spun around to look, and then he immediately averted his eyes. Before him was a gorgon. Her mane of snakelike tendrils undulated around her head. Her eye sockets glowed like lanterns in the gloom, but they did not seem to be aimed at him. He found he could still move and breathe. "Vraska," he said. "No, I haven't." "But you've heard of me." "I didn't know you were a Planeswalker. But I'd heard your name." "I have Jace Beleren at an informational disadvantage, then. How does that feel?" she asked, strolling about the square around him. "Have you deduced why you're here?" "I suspect you brought me here because you want to show me something," said Jace, blinking downward, trying to resist the urge to follow her with his eyes. "I just hope it's not that gaze of yours." "No, no, no. I want you to show me, Beleren. I arranged this visit because I want you to prove to us what's inside you. Show us whether you'll be our ally. An ally of Ravnica." "Murdering Ravnicans is a strange way to be Ravnica's ally," Jace said to the cobblestones. "So is stealing control of the Guildpact!" Vraska snapped. Her tendrils snaked and knotted frantically, then slowly calmed down again. "This not your plane. And yet you take such a strong interest in it." "I am only trying to keep the guilds from killing each other. This responsibility has fallen to me, and I take it seriously. I assume that you haven't brought us here to offer your help." "So what do I want?" Jace considered this. "To destroy me." "To... take my place." He didn't know if anyone else could become the Living Guildpact after him. But he knew that if there weren't one, it would certainly open doors for an ambitious gorgon. "No. You want to rule Ravnica." "You being dead would conveniently free my hands. You and your colossal cheat have imposed artificial limits on me. So, yes," she said casually. "I'm ready to kill you now." Vraska snapped around and looked Jace full in the face. Her tendrils swam in the air and her eyes flashed, illuminating Jace's form and lighting the plaza around him. 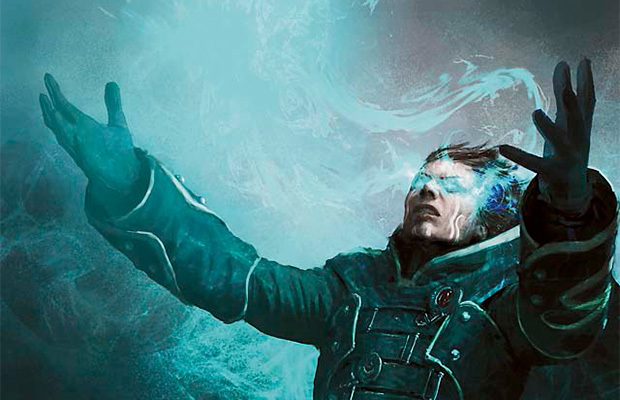 Instead of turning to stone, Jace melted away into nothingness. Or at least the image of him did. "Can we dispense with the illusions, then?" said Vraska loudly to the air around her. Jace appeared from behind a column. "As long as you actually send Milada, Kobrev, Zdenya, and Dibor away." "Four assassins, plus the one you killed yourself," Jace said. "I appreciate the compliment. But I think you're fully able to kill me on your own." Vraska gestured a signal toward the corners of the plaza. Shadows shifted near the walls as hiding figures moved away. Jace felt their minds grow distant. "Thank you. Are you going to kill me now?" asked Jace, now truly averting his gaze. Vraska shook her head reprovingly. "Think, now. That's not my ideal scenario, is it?" "Probably not. Magical enforcement of the Guildpact can be used to your advantage. Especially if that Guildpact happens to be a person." "So you want to leave me in the office of the Guildpact, and manipulate me. Swing my decisions in your favor. I presume you have something on me? Some form of leverage?" 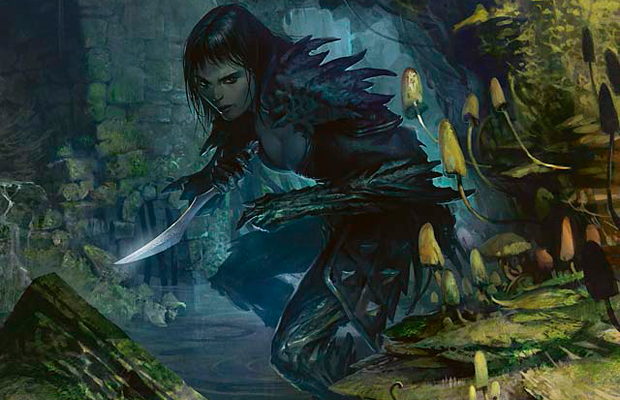 Vraska's tendrils rippled around her face. Jace caught sight of a fangy smile. "Tell me, do you know the names of all the assassins who currently surround the home of Emmara Tandris?" Jace's face darkened. "The person who seems to live in Emmara's home is one of my illusions," he said carefully. "Emmara has gone into deep cover. Her entire house is an elaborate trap. Your assassins will be arrested as soon as they strike." "Probably a bluff," said Vraska. She strolled in a semicircle, observing Jace, until she was standing behind him. "But a sufficient one. It doesn't matter anyway. What's really going to happen is that I'm going to threaten many, many things you care about. And then you are going to agree to work for me." "Oh, but I can make things very uncomfortable for you. Just imagine the headlines. 'The Living Guildpact Unable to Prevent Petrification Murders!' 'Ten More Statues Left on Doorstep of Chamber of the Guildpact!' Not to mention the angry, angry guild representatives I'll have storming your chambers." "Drop this now. Go back underground. If you make yourself unobtrusive, I can handle quieting down this case. And Lavinia." "Become my assistant, and you won't have to deal with her again. Every person who crosses me will meet their deserved fate." "I've told you no. Ravnica is under my protection." Vraska hissed, suddenly close behind him, and Jace felt a tendril touch his ear. "How fortunate for Ravnica," she snarled. "Are you going to protect it the way you protected Kallist? Or Kavin?" She had certainly dug deeply into his past. He wondered what else she had found out about his life, and what her sources could be. "And what about Garruk Wildspeaker?" "I've made mistakes, yes. But I choose to use my position to atone for—wait, what about Garruk?" Vraska snorted. "You don't know what's become of him, do you?" "Never mind. I'm sure you've already failed him as well. You're a plague, Beleren. A scourge to all those you claim to protect. Declaring your loyalty to me will be your first favor to this world." A tendril wrapped around Jace's neck. Jace grabbed at it and tried to peel it back, but Vraska was strong, and her hair engulfed his face. He felt his throat clamp shut as the tendrils slithered tighter and tighter. Jace struck into her mind, and immediately wished he hadn't. Her thoughts swirled with hundreds of ways of killing him or making him suffer. He saw himself choked to death. Tossed from a bridge in a sack. Pulled down into the muck of the undercity tunnels by grimy, clawed hands. Paralyzed and forced to watch snakes crawl into his clothes, while feeling their needle-like fangs sink into him. Her creativity was boundless. He needed to push deeper, but he also needed to breathe. He conjured a spell. Vraska was not impressed by the first illusion of another Jace lunging at her. She batted it away and it dissipated instantly. But the next Jace rushed toward her quickly enough to slash at her cheek with hands that were sharp as daggers. She hissed and clawed the image away. But the next one came even faster, and the next bolted toward her from the opposite direction. Jace felt the gorgon's grip loosen as he sent image after image of himself at her. As the Jaces attacked, they changed. Their hands became claws. Their hair became snakes. Their eyes glowed with sinister light. They hissed as they emerged from the shadows from all directions, surrounding Vraska in a nightmarish horde. Vraska couldn't fight them all. She began blasting them with her gaze. They came at her, turning to stone one by one as she lashed them with petrification. As the stone statues multiplied, they became a cage. She was penned in by a dozen effigies of Jace. He hoped they were real enough to her to make her feel trapped, at least for the moment. Vraska held the real Jace by her claws. She squeezed his neck again. "Send them away," Vraska whispered, and his breath was cut off. And then the statues' lips began to move. "You win," they said in unison, in Jace's voice. "Back them off." She said it like a snarl, but there was a flicker of hesitation in her voice. The statues retreated slightly, but she was still caged by their stone forms. "Jace will help you," they said. "But he has to know the plan first." "You'll do what I tell you, when I tell you, Beleren." "Kill him, and he can't influence the guilds for you," the statues intoned. "He has to know whether you'll be a worthy partner. Whether you're smart enough. Tell us. How do you intend to take over this city?" Vraska squeezed for a moment, pressing all the blood out of Jace's head. But her grip relaxed again. "With your help, I will neuter all the guildmages. Disempower them by having you redraw territory borders, rupturing their mana bonds. Defang the guilds by taking their spellcasters. Then, one by one, I will assassinate the guild leaders." 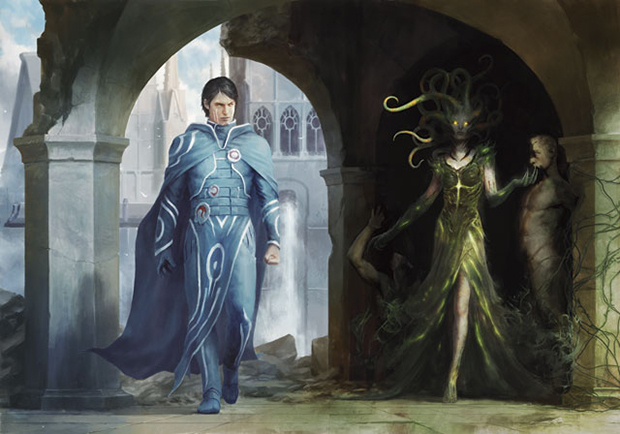 "You, Vraska, will assassinate every guildmaster?" "I was born to kill," she said. "And many in the shadows answer to me." "Thank you," said the statues. Then they all tilted their heads. "Did you get all that?" they chanted. Vraska looked around at all of them. "What?" For a moment, the statues' eyes flashed, bathing Vraska in a blinding strobe. She put a hand up to her face to shield herself from the glare. "There is a summit of many guild leaders going on at Sunhome tonight," droned the Jace statues. "Your statements have been broadcast to all those who've attended." Vraska snarled. "Deal's over, Beleren," she said. "Now you die." She grasped the neck that she held in her claws, and crushed it. It broke into rocky pieces. She looked down, and instead of seeing a dead Jace, she saw that she had been holding the petrified form of her own assassin—the woman she had killed earlier. He had switched places with her at some point. Vraska howled in fury. She spun and slashed at the cage of Jaces. Instead of breaking into pieces or dissipating into the air, they closed in on her. They sprouted ever more snakes from their heads, their eyes, their fingers, and constricted in around her. They grabbed her wrists. They intertwined with her tendrils. With a shriek, she blasted them all back. Then she took a breath, closed her eyes, and planeswalked away. "I don't know how you did it," said Lavinia, back at the Chamber of the Guildpact. "But there she was, floating in the middle of Sunhome, telling her plans to everyone at the summit. A remote confession. But what's to say she won't return?" "She'll lay low for a while," Jace said, rubbing the welts on his neck. "It should buy us some time, I hope." "You couldn't just end her? Or command her to stop?" Jace shook his head. "I barely had the presence of mind to distract her, distort her perceptions. She certainly wasn't giving me an opening to destroy her mind—she fought me at every step." "At least the guilds are aware of her now," said Lavinia. "The Boros want to turn the undercity upside down. They seemed almost giddy about it." He looked out the window. Streetlamps threw illumination down at the cobblestones and up at the city spires. The skyline looked like the looming mountain ranges of Zendikar. "I'm sure you and Isperia can help guide them." Lavinia studied him. "You've got that face. Your 'I'm going to be away for a while, and don't ask where I'll be' face." "It should only be a couple of days." "You should stay. There'll be arbitrations to do. Reassurances." He gathered his cloak around him. "The Guildpact is supposed to keep people safe," he murmured. "But I've only brought them more danger. And I think something's up with Garruk." "Someone I may not have failed yet." Play out the battle between Jace and Vraska with Duel Decks: Jace vs. Vraska , which releases this Friday, March 14, 2014. 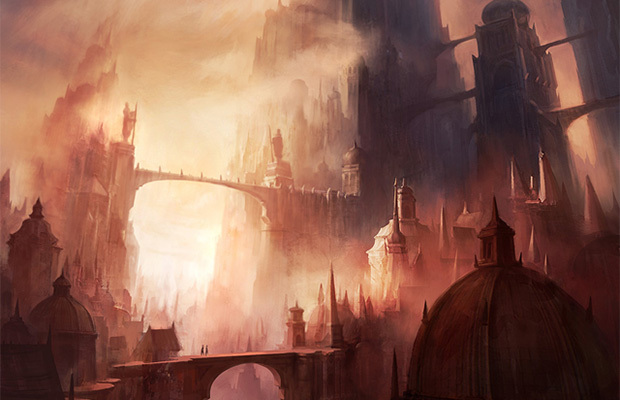 Read how Jace became the Living Guildpact and his other activities on Ravnica with the three-part novella, The Secretist. Find Amazon and Nook links in these three feature articles about it: Part 1, Part 2, and Part 3.